the daily be: do: surprise squared. my friend erin just had the best week ever. last sunday, we were all having brunch and the subject of erin's birthday came up. we'd been planning to have a surprise party for her and our friend, sarah, had been a big part in organizing all the details. at brunch sarah says to all of us, "so...i have a secret to tell you." of course we're immediately all ears. 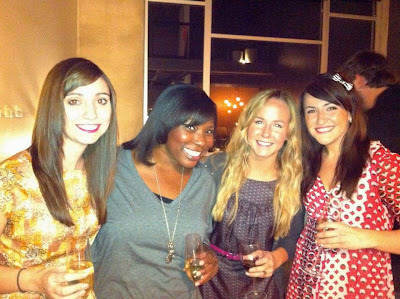 "erin's surprise party isn't just for her birthday. 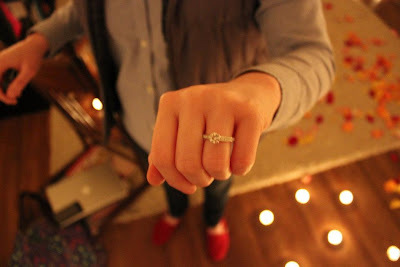 it's also going to be an engagement party!!!" we all shrieked in excitement and demanded the details. 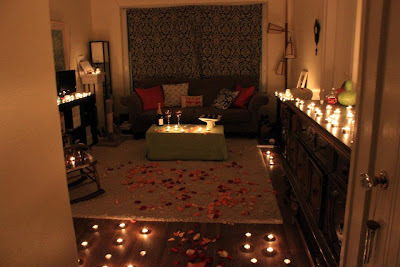 sarah had been recruited by sam, erin's boyfriend, to set up their apartment with candles, flowers and champagne so that it would be waiting for them when they returned home from a weekend trip to chicago. after driving all day, a romantic proposal was the last thing erin expected. anyway, the surprises didn't end there. 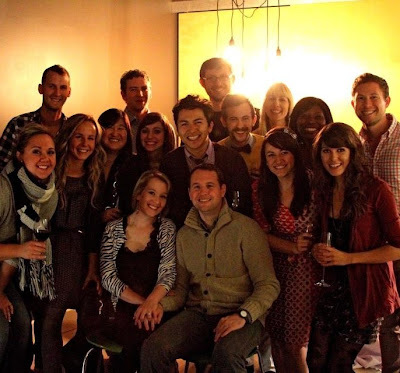 on friday night, we all gathered to celebrate erin's birthday and the marital bliss that awaits her and sam. erin seemed very surprised and we all went on to have a fantastic evening with lots of laughs and so much joy. congratulations to you, erin & sam! Sounds like a great time! The pictures made me think of the party scene from Julie & Julia (my fave!). Very chic!